Add butter and sugar to a bowl and beat with hand mixer until well combined and fluffy. Add flour, milk, vanilla extract, and salt and mix to combine. Stir in chocolate chips with a rubber spatula. 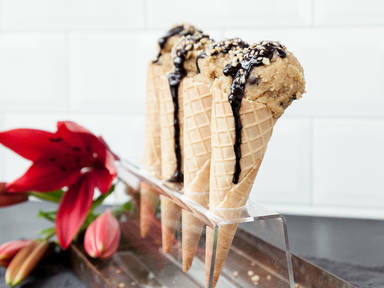 Serve in ice cream cones or small bowls. If desired, decorate with melted chocolate and chopped hazelnuts. Enjoy!